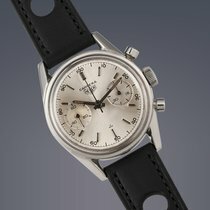 This cool Heuer chrono is a rare iteration of the legendary Carrera, one of Jack Heuer’s most important creations. Measuring 36mm across, this is a good sized chrono with two register layout and unusual blue decima scale, which is referenced by the ‘d’ in the reference number(used for counting production numbers!). The cream dial has a raised outer seconds track and in from that is the unusual decimal scale in blue. The hands have all their lume intact and are in flawless condition. The steel case remains in very strong overall condition. The watch retains its original winding crown. The manual wind valjoux 92 movement has been fully serviced by our watchmaker and the Carrera will come on a strap of your choice from our webshop*. Please note that the price listed here includes the Trusted Checkout Service associated with Chrono24 and may therefore differ from the retail price on our own webshop.